Old Oak Common, where the high-speed HS2 railway meets Crossrail, provides a huge opportunity to create a fantastic transport hub. But Tfl, Network Rail and the DfT are missing the opportunity. The site at Old Oak Common, next to Wormwood Scrubs, is planned under by HS2 Ltd to provide a new station linking the high speed line with Crossrail and the GWML (Great Western Main Line) to Reading and beyond. All trains on HS2 and Crossrail are intended to stop, and potentially every train on the GWML as well. On the maps, the Central line is in red, the Bakerloo in brown, HS2 in blue, London Overground in orange, Southern services from East Croydon to Watford in green, Crossrail/GWML in black (across the south side of the site) and the WCML (West Coast Main Line) in black (across the north side of the site). Freight lines are shown in black and a narrower. The base map is taken from an official guide to the regeneration and thus shows future buildings, not current buildings. However, there are no finalised plans for integration of other railway lines in the area. These include the Central line, the Bakerloo line, the Overground line to Richmond and the Overground line to Clapham Junction. To remedy this, TfL have been working on plans to link the new Old Oak Common station to the Overground. Unfortunately, TfL's plans are very poor. TfL have also put forward a cheap as chips option (known as X) which does not include the southern station and only includes the western station, forcing passengers on the Overground from Clapham to North London to endure a 10 minute longer journey and a reversal of direction. It is so bad its not even worth covering here. The first is the obvious one - without a good rail connection into the heart of the hub, millions of potential passengers in South West London and beyond will face a much worse experience accessing HS2 than they should. As a result, many will choose to travel to Euston rather than Old Oak Common, overloading Euston's capacity. The second point is freight. The Old Oak Common area currently supports many links between the various lines, allowing freight to move around the country. These links need to be protected. The final point is redevelopment. A key rationale for the site is enabling a major redevelopment of the area. Achieving redevelopment is hampered by the presence of lots of railway lines, each requiring bridges and taking up lots of land. The result is a dramatic improvement in the viability of the rail hub. Overground services from Clapham would run from Shepherds Bush to Old Oak Common and then on to North Acton. Beyond North Acton there a various options (not discussed in detail here) including High Wycombe, Alperton, Uxbridge and West Ealing. Overground services from Richmond would run from Acton Central to Old Oak Common and then on to Willesden Junction. Passengers travelling from Clapham to Willesden Junction and beyond would have a simple cross-platform change at Old Oak Common. Southern services would run via the Central Viaduct without stopping at Old Oak Common. A new Overground service would be possible from Old Oak Common up the Dudding Hill freight line to Neasden and beyond. A good set of freight links are provided, including a new one from the Dudding Hill line to the West London Line. However the link from Reading to Euston is lost. So why do I propose this scheme rather than other possibilities? The key is that, as shown on the map, a large number of railway lines could be removed entirely, opening up the site for redevelopment. In particular, the eastern side is opened up to Scrubs Lane, and the western side is completely opened up between Old Oak Common Lane and Victoria Road. All that would remain would be a single central viaduct, designed to handle all north-south traffic. And it is that unifying factor that makes the plan work most effectively. It is likely that the central viaduct approach is more expensive than TfL's option. However, that extra cost is paid back by the value of the additional land that is made available for development. A cheaper version is also possible if required. As a final note, if a Crossrail link to the WCML is built, that works fine with this scheme. Southern services would be diverted via the new Crossrail link. In addition, it would be possible for the London Overground Clapham route to run to Watford Junction via the same link. I propose a plan for Old Oak Common based around a unifying central viaduct. Such a viaduct allows the replacement of all the north-south lines in the area, making redevelopment much more effective and increasing the land available. It also enables the London Overground to be integrated into the heart of the hub, where it needs to be to be effective. Finally, additional Overground links to North Acton for the Central Line and Neasden for the Jubilee line become possible. The Overground route that is lost is Clapham to Willesden Junction and the North London Line, but it is replaced by Clapham to North Acton and a cross-platform change to the Richmond to Willesden Overground route. My suspicion is that the viaduct would need to be 4 tracks to avoid being a bottleneck, and there may need to be two tracks without platforms through Old Oak station itself. The TfL curve is tight, but worse as it very long, and with a reverse bend curving both left and right to make the tight corner. The curves I propose have a greater or equal radius, are shorter in length, and do not have a reverse bend. I do think a Dudding Hill Overground service makes sense, but I suspect that the Government isn't going to fund it any time soon. Although my plans include it, the new line to the Dudding Hill route could be omitted - its just that you'd need to keep the route through Acton Wells, which reduces the regeneration effects. The major mistake with HS2 and its terminus routing into London is the missed opportunity to provide a solution and integrated passenger solution for the modern railway network. The earlier proposed routing of HS2 into Euston as the terminal station much like HS1 into St. Pancras would have provided a opportunity for the redevelopment of Euston, which almost all would agree, is a major mistake of railway planning from the 1960s and the subject of redevelopment talks for many years. There is also the fact that there is now no proposed linked between HS1 and HS2 at Old Oak Common when if there had been a determined effort HS2 could have been routed into St. Pancras International to link up directly with HS1 and provide a direct through route to the continent. St. Pancras International is already a award winning revamped international terminal that handles HS1 traffic, the high speed javelin services as well as domestic services. The routing of HS2 into this station would have provided a excellent and well planned major continental and domestic interchange station. Capacity problems from the routing of HS2 into St. Pancras International could also have been solved with the fact there is still spare land available for another extension to the station to provide additional capacity and platforms to cope with the additional traffic. As well as the london overground run from Clapham Junction to High Wycome along the central line tracks, why not have the parralel New North Main line bring in all the chiltern main line long distance trains. This would provide a better connected london terminus than Marylebone, the latter serving as the terminus for all the Aylesbury and Metropolitan line trains? This is very good. All you need to do is put the Overground platforms on the curves by the GW mainline and you can continue with Clapham/Richmond - North London Line services exactly as at present. Swap the central line and overground somewhere around White City. The central line would then nicely follow your proposed Overground station and line through Old Oak Common and then go on it's usual way to North Acton. Overground from Clapham would go via East Acton and then use a new viaduct right across the Old Oak Common station and then northwards up to Willesden Junction. Overground from Richmond would need a new set of curves to be able to use the same viaduct. One thing worth remembering is that there is almost no use for an Crossrail / Central Line interchange. Both lines serves almost the same stations in central London. The remaing interchange reason is for travelling between the Ruislip branch of the Central line and Crossrail west of Old Oak Common. 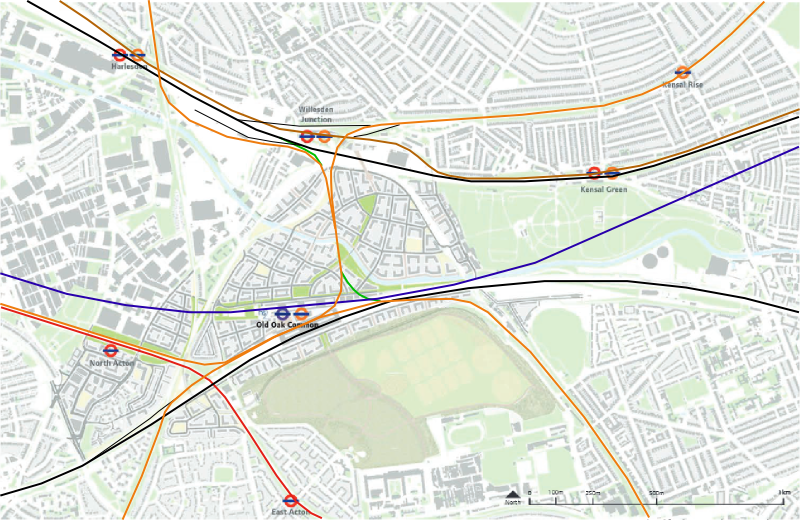 That interchange could be done vith an extra interchange eather via the Central lines Ealing branch or via the Greenford - Ealing line. Swapping the Overground and Central might be possible, although it involves a greater level of change to the area. That said, it seems that the politicians and planners don't understand transport and just want to build a depressing non-interchange.